Tonya Frisbey brings to the Honors College nearly 20 years experience in non-profit advancement. Her background encompasses a broad range of fund development work for both universities and charitable organizations, covering the spectrum from major, individual donors and corporate giving to planned giving, government grants and foundation work. Prior to her current appointment at the Honors College, she lead the American Red Cross as a Major Gift Officer. 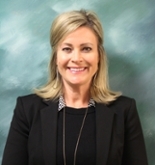 Additionally, Tonya launched a major, capital campaign as the Director of Development for the College of Education and Human Services at Central Michigan University and spearheaded major gifts as the Director of Corporate and Foundation Relations at Northwood University. She received her bachelor's degree from Alma College.